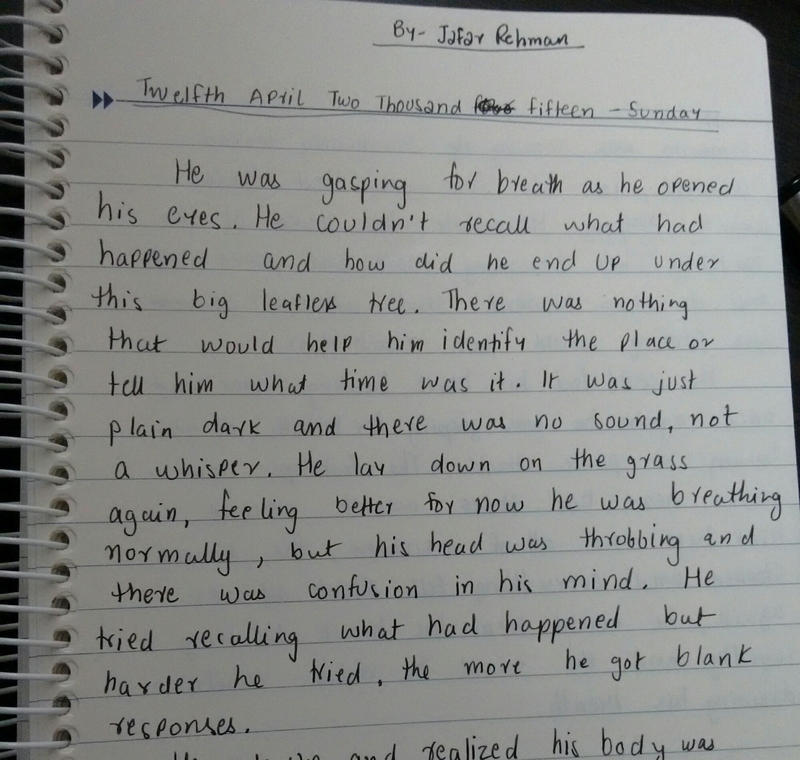 Straight from the diary(may have mistakes and errors,ignore them)He was gasping for breath as he opened his eyes.He couldn’t recall what had happened and how did he end up under this big leafless tree.There was nothing that would help him identify the place or tell him what time it was.It was just plain dark and there was no sound,not a whisper.He lay down on the grass again,feeling better for now he was breathing normally,but his head was throbbing and there was confusion in his mind.He tried recalling what had happened but harder he tried,the more blank responses he got. He got up and realized his body was sore,like he had been working out for a long time but he didn’t remember doing anything,everything was blank.His eyes were watering but he could see better now.Suddenly he heard a faint sound of footsteps,but it soon was clear that someone was coming.He frantically looked around in all the four directions but there wasn’t anyone.Meanwhile the sound of the footsteps was becoming more and more clear and it was evident that whoever was coming would soon reach him. He could feel his heart beating faster and once again he was gasping for breath,he was having a panic attack.The footsteps now were near but there wasn’t anyone near him and all of a sudden the sound stopped and everything fell silent all over again.The only sound he could hear was the sound of his heart beating rapidly and the sound he made while drawing large breath. I wrote only this much.How was it? Previous Post All It’s Cracked Up to Be.